Limited edition of 500 copies incl. 2 bonus tracks. Hailing from Chicago, Illinois, MAELSTROM can easily enter in those ranks. 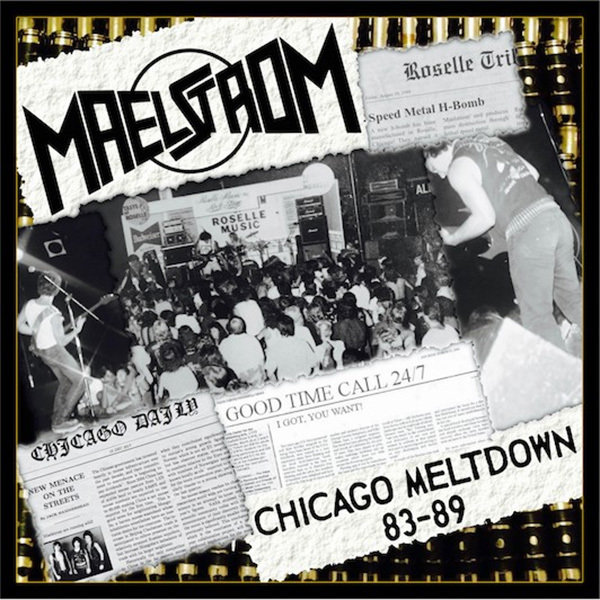 Formed in 1983 by two brothers, Joe and Nick Sanzeri, together with childhood friend Jeff Haske, MAELSTROM has gained some interest in recent years, among 80s Speed fans and Chicago Metal enthusiasts, fueled by their obscure amateur video 'H-Bomb'. Their demo recordings can be considered extremely rare nowadays (web world included), especially their insane 1986 demo Hammerhead. It is with a great delight that we bring all those songs for you, available on CD for the first time! In the 'CHICAGO MELTDOWN 83-89' CD, be prepared for 10 songs of pure Speed Metal madness, with a good amount of early-EXCITER/ABATTOIR vibes: the entire Hammerhead and Break Down The Wall's demos, with 2 bonus tracks, including the Unleash The Dogs' song, present in the notable compilation LP of Chicago's best bands ΅Chicago Metal Works Battalion #1' (SLAUTER XSTROYES, PARADOXX, WAR CRY, etc)! Comes with a 12-page booklet containing the band biography (written by Joe Sanzeri), band photos and song lyrics.